A sports bike in its purest form. Reduced to the essentials. Agile, fast, suitable for A2 driving licence and extremely sporty. Whether you are on country roads or the racetrack, the Moto3 genes are perceptible in every maneuver and convey pure race feeling. The handling – simply spectacular. The performance – incredible. The power – awesome. SEAT: The two-part seat offers first class supersport ergonomics with perfect support for rider and pillion. With a seat height of 820mm enables the rider to have a secure stand while also being high enough for sporty use and real big-bike feeling. BRAKES: KTM in cooperation with Brembo developed a powerful, excellent to dose brake-system which allows the rider to be always in full control of the RC. A four piston radially bolted caliper in combination with a single brake disk (300mm diameter) in the front and a single piston floating caliper with a single brake disk (230mm diameter) for the rear wheel guarantee excellent breaking reaction even in the sportiest manner of riding. STANDARD ABS: ABS is equipped as standard on every RC 390, ensuring maximum safe on any road condition. When taking the RC to the racetrack ABS is of course disengageable. WHEELS: Equally lightweight as stable, the 17in orange painted cast light alloy wheels are fitted with grippy Metzeler tires - 110 mm wide at the front and an impressive 150 mm at the rear. The tires impress with tremendous grip in both wet and dry conditions, as well as providing supreme durability. 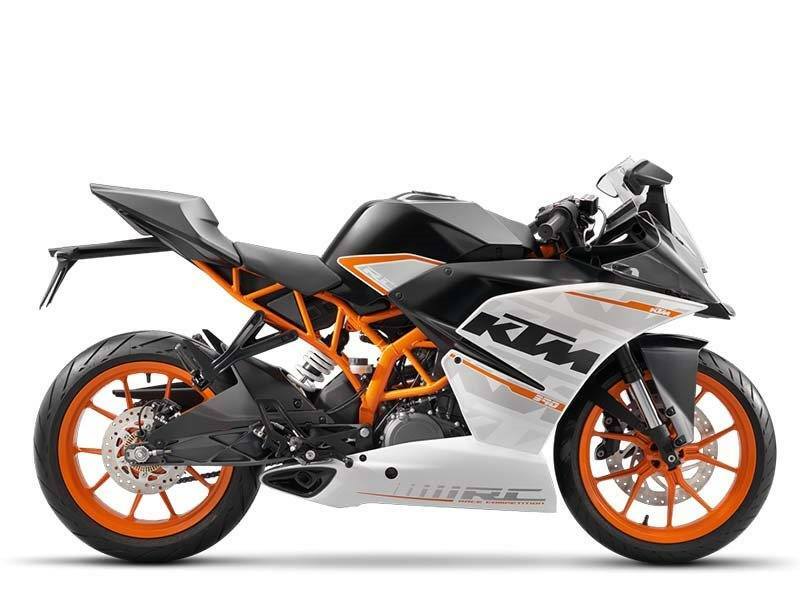 A2 LICENSE: With a power/weight ratio of 0,2kW/kg RC390 is right at the limit of the new A2 driver´s license, making the new KTM RC390 the sportiest option for A2 riders.